Subscription for minimum one / two years only. No refund of the subscription charges, once the subscription starts. Readers are advised to make appropriate enquiries before entering into any commitment for making payments in relation to any advertisement published in this paper. 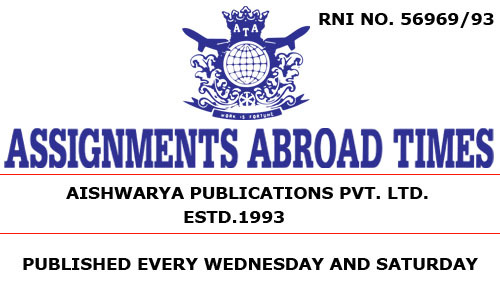 Assignments Abroad Times shall not be held responsible for any consequences thereon. Once the subscription charges are received by us , you will receive a computer generated Login Id password by e-mail. The subscription charges can be paid for any bank through their online money transfer system. If there is any natural calamity /network or technical error to read the e-paper, it will take 24 hrs. to rectify and solve the problem, or we can send you the hardcopy on your request by ordinary post only.